We are all looking for ways to increase production without sacrificing quality. One of the most cost-effective ways is by improving the substrate material of your hob. Solid carbide hobs are widely used in many applications throughout the world. LMT-Fette was the first to demonstrate the use of solid carbide hobs in 1993 on modern high-speed carbide (HSC) hobbing machines. Since then the process of dry hobbing has been continuously improving through research and product testing. Dry hobbing is proving to be successful in the gear cutting industry as sales for dry hobbing machines have steadily been rising along with the dramatic increase in sales of solid carbide hobs. There are great advantages in dry hobbing, not only for friendliness toward the environment, but also for increasing productivity and for decreasing manufacturing cost. Dry hobbing, however, often causes failures in hob cutting edges or problems with the surface quality of gear tooth flanks. These difficulties are not present when hobbing with cutting oil. Pinching and crushing of generated chips between the hob cutting edge and the work gear tooth flank is considered a major cause of those problems. Nowadays, finish hobbing (which means that there is no post-hobbing gear finishing operation) is capable of producing higher quality gears and is growing in popularity. Recent trends in gear cutting technology have left process engineers searching for direction about which combination of cutting tool material, coating, and process technology will afford the best quality at the lowest total cost. Applying the new technologies can have associated risks that may override the potential cost savings. The many interrelated variables to be considered and evaluated tend to cloud the issue and make hobbing process development more difficult. To meet the future goals of higher productivity and lower production costs, the cutting speeds and feeds in modern gear hobbing applications have to increase further. In several cases, coated carbide tools have replaced the commonly used high speed steel (HSS) tools. It takes confidence to be the first to invest in new manufacturing technology. But the payback can be significant. That has been the experience at the Ford Motor Company's Transmission & Chassis Division plant at Indianapolis, IN, which boasts the world's first production application of dry hobbing. With reference to the machining of an involute spur or helical gear by the hobbing process, this paper suggests a new criterion for selecting the position of the hob axis relative to the gear axis. New tool from LMT-Fette provides combination of operations. The seemingly simple process of placing a uniform chamfer on the face ends of spur and helical gears, at least for the aerospace industry, has never been a satisfactory or cost effective process. Load-carrying capacity of gears, especially the surface durability, is influenced by their tooth surface roughness in addition to their tooth profiles and tooth traces. The newer profile-shifted (long and short addendum) gears are often used as small size reduction gears for automobiles or motorcycles. The authors have investigated the damage to each cutting edge when small size mass-produced gears with shifted profiles are used at high speeds. The following article is a collection of data intended to give the reader a general overview of information related to a relatively new subject within the gear cutting industry. Although carbide hobbing itself is not necessarily new, some of the methods and types of application are. While the subject content of this article may be quite broad, it should not be considered all-inclusive. The actual results obtained and the speeds, feeds, and tool life used in carbide hobbing applications can vary significantly. Question: When cutting worm gears with multiple lead stock hobs we find the surface is "ridged". What can be done to eliminate this appearance or is to unavoidable? The gear hobbing process is a generating type of production operation. For this reason, the form of the hob tooth is always different from the form of the tooth that it produces. 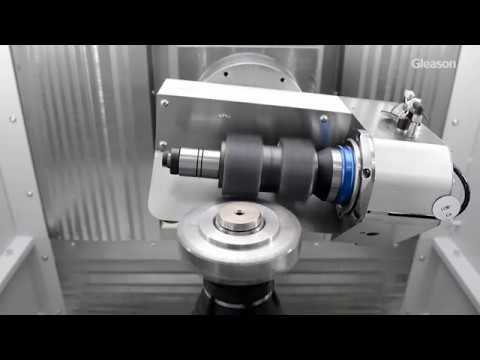 Decades ago, technology shifted from HSS to indexable inserts in turning and milling. This movement wasn't immediately realized in gear hobbing because coated PM-HSS hobs and complex gear profiles remained highly effective and productive methods. Only fairly recently have gear manufacturers started to take a serious look at indexable technology to cut gear teeth. I make all the double helical gears that go into a gearbox - four different gears in this unit. If the gear module for the bull gear and the intermediate gear are the same (these are the two individual gears that mate), and the gear module for the high-speed pinion and high-speed gears are the same (these are the other two individual gears that mate in the gear box as well), is it then possible to just use two hobs in this setup to make all four gears, since they mate together with each other? We are currently using a different gear hob for each gear. The latest technological solutions help keep chamfering and deburring operations in-line -- often without increasing cycle times. 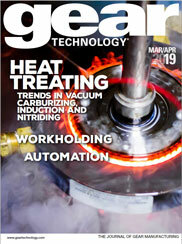 Since we are a high volume shop, we were particularly interested in Mr. Kotlyar's article describing the effects of hob length on production efficiency which appeared in the Sept/Oct issue of Gear Technology. Unfortunately, some readers many be unnecessarily deterred from applying the analysis to their own situations by the formidabilty of the mathematical calculations. I am making the following small suggestion concerning the evaluation of the constant terms. Some results of evaluation by this method in the automotive industry. Helical gears can drive either nonparallel or parallel shafts. When these gears are used with nonparallel shafts, the contact is a point, and the design and manufacturing requirements are less critical than for gears driving parallel shafts. The Dictionary of American Biography describes him as "one of the founders of the gear-cutting industry in the United State." He built the first hobbing machine for cutting spur gears. He founded the companies that are now Boston Gear and Philadelphia Gear Corp. I'm a big believer in the value of IMTS as a marketplace where gear manufacturers can go and look at the latest machine tools and processes; compare hobbing machines, gear grinders and inspection equipment; see turning, milling or grinding machines in action; and ask questions of the various vendors all in one place. This year's IMTS promised to be the biggest ever, and I have no doubt that it will be a valuable experience to those who go there looking for ways to improve the way they manufacture products. Traditional methods of manufacturing precision gears usually employ either hobbing or shaper cutting. Both of these processes rely upon generating the conjugate tooth form by moving the work-piece in a precise relation to the tool. 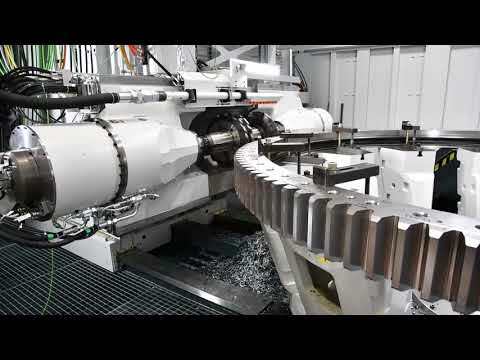 Recently, attention has been given to forming gear teeth in a single step. Advantages to such a process include reduced production time, material savings, and improved performance characteristics. Drawbacks include complicated tool designs, non-uniformity of gears produced throughout the life of the tooling, and lengthy development times.